As of current version, 1.4.1, you can authorize the program to access your data, browse your timelines (including jumping to any page with Control+G or clicking on the page number), post text with some formatting (to Public, Followers, person lists and specific people), upload pictures, audio, video and other files, interact with the posts (like, comment, share, edit and delete) and the comments (like, edit and delete). You can also edit your profile, change your avatar, change your e-mail, watch the minor activity feeds (meanwhile, mentions and actions) with snippets, open posts from there, follow people from their avatars, manage your contact lists, including ‘person lists’, browse their posts (if they’re in the same server as you) and follow new people. You can set up a network proxy if needed. Check the Dianara category on this blog for more up to date information. There are also a lot of configuration options (such as fonts and colors), a tray icon, and FreeDesktop.org notifications. 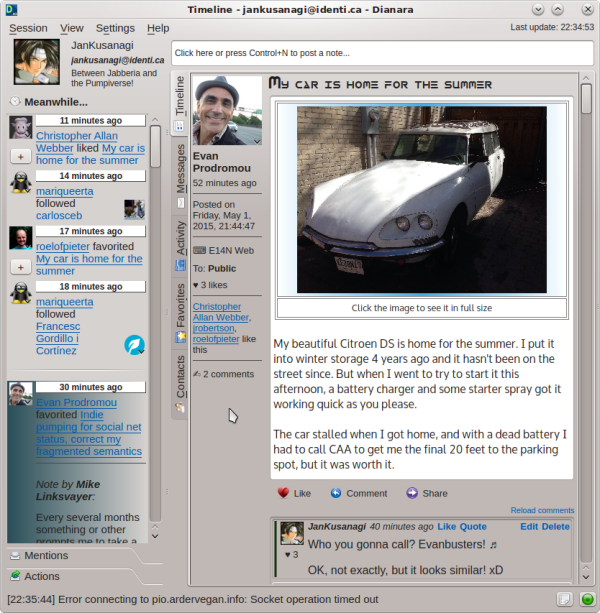 Dianara is available in Chakra, Mageia 4 and later, Debian 8 (Jessie) and later, Ubuntu 13.10 (Saucy) and later, KaosX, openSuse 13.2 and later, Parabola and Fedora 26 and later repositories. The latest development code is in GitLab.com, at https://gitlab.com/dianara/dianara-dev. Latest stable version can be found at linux-apps.com or at Dianara’s release archive at dianara.nongnu.org. On the technical side, it is, as usual with my projects, based on Qt, and using QOAuth. Check the INSTALL file carefully for details. See also the BUGS and TODO files for a list of known issues and missing features. If you find a bug, or wish to request a feature, go to the issue tracker. If you’re interested in translating Dianara into your language, please let me know. It mainly involves using Qt Linguist, and it’s quite easy! The source code includes a TRANSLATING file, with instructions. Since July 2013, Dianara can be used as a client for identi.ca, which is now part of the global federated Pump network. Dianara was going to be a Diaspora client in the beginning, hence the name. but doesnt receive posts – does it use system proxy settings or environment vars? There is no specific code for proxy support, I don’t know if it’s necessary, but I think it’ll use system settings (I don’t have any such setup). If your pod is diasp.org, you need Qt 4.8 and a recent version of OpenSSL, since they have strict security there, and I’ve seen that with older versions it just won’t connect. If one of the last lines in the terminal says “Request finished. HTTP code: 0”, that’s probably your case. Yes, it looks similar in several ways. Not so much with the side panel, but if you hide it, it looks quite similar, yes. Do you plan to use some kind of package repository (or 0install) to publish binary builds? openSUSE build service can help in building packages for serveral distributions and architectures. I thought about OBS, but never got around to trying it. Still, my hope is that some distributions will package it, as they did with another one of my programs. If somebody packages it for Debian, the Debian-based distributions will likely have no problem using the same package, or importing it. If somebody packages it for Mageia or Fedora, probably the RPM-based distributions won’t have problems either, since the dependencies are quite simple. Great to hear that, OBS is pretty sweet, but it requires spec files for the packages, etc. Alternatively you could use 0install to provide your own compiled packages (plain tar or zip files). I found 0install to be a lot easier packaging method than rpm/deb packages. Well, I don’t think going around the package manager is a good idea, so I’d rather use OBS and build proper packages, but thanks for the suggestion! The openSUSE package is gone (and was seriously outdated anyway). Maybe it’s time for that your official OBS Dianara repo? Which is going to be good for another 1 release? Seriously if I had the knowledge (or if it was more user friendly) I’d make my own OBS repo. But relying on other people’s private repos isn’t a good idea for what I know – you end up with hundreds of repos linked in your system, which mostly are outdated. So I guess I’ll have to stick with compiling myself (which I’ll do when ver0.8 finally gets on my nerve 😛 ). Using v. 0.8 for identi.ca. Keeps reporting unhandled HTTP error 301 for URL beginning with https://secure.gravatar.com. Is there a place to report/discuss issues or is it too early in the dev process for it? Don’t worry, I’ve had this issue with identi.ca too. This should stop when (if) certain users update their avatars, but in any case, the development version of Dianara (what you can get from gitorious) now ‘handles’ that. By ‘handles’ I mean that it doesn’t pop up a notification for that, it just notifies it in the status bar, so it’s much less annoying. I might implement proper support for this HTTP 301 error (moved permanently), but it’s a problem that should go away by itself anyway. Thank the Debian packagers for that! Please change “Previous page” and “Next page” buttons at the bottom to something like “Newer” and “Older”. Also, in Spanish, maybe it is possible to use “Les gusta” when the number is bigger than 1? And sure, the translation can be different for plural. Or I might change the translations, since it’s a somehow “free translation” of the english string “1 like / 2 likes”. The effect of auto-refresh on the UI is extremely annoying. I just lost a comment I was writing. There’s a big change planned for how the updates are handled. But still, losing a comment shouldn’t happen, because while you’re commenting, updates to the main timeline are blocked. This can, however, fail if you start commenting in post “A”, then start commenting also in post “B”. At that point, cancel or send the comment for post “A”, and the updates become unblocked. At that point, the auto-update can happen and kill your (ongoing) comment for post “B”. This is documented in the BUGS file. I’m “woodsmoke” been a Linux user since Xandros and have been with Kubuntu for the past few years. I am here because I was working with Kontact and wanted to set up an identi.ca identity for Akregator. Since Identi.ca has been deprecated but it did allow me to set up an identi.ca account using “pumpity”. However, it provided the “farm game” but was otherwise non-functional. I then found Dianara and instaled it from the repos (9.1) and went through the import of the pumpity user. However, I did not “see” what I expected to see in terms of “Twitter” or in terms of the screen shots at the Dianara blog. After a bit of a struggle I was able to “follow” myself at Facebook and a blog page about Dianara that had a “finger”. However, again, I don’t “see much”. I was involved in another social networking app at another distro and so I have some experience in working with apps in development, etc. Since I am running Trusty, I did the ppa for i386 for the 1.1 and still, I don’t see the side tabs, etc. What I see is the “gray version” but again, but there are no side tabs, etc. and no way to enable side tabs etc. Another thing is that there is a button for viewing the profile of one of the people I’m following, which is supposed to open in a browser but the function does not work. Is what I have on my machine the situation that “KDE” has not worked with the Dianara devs, such as OpenSuse seems to have done, or…what ? I am interested in the app, and will be glad to report on what I can do with it as it progresses. I am not a “coder” but am very good at putting an app “through the paces”, and reviewing it, writing instructions etc. 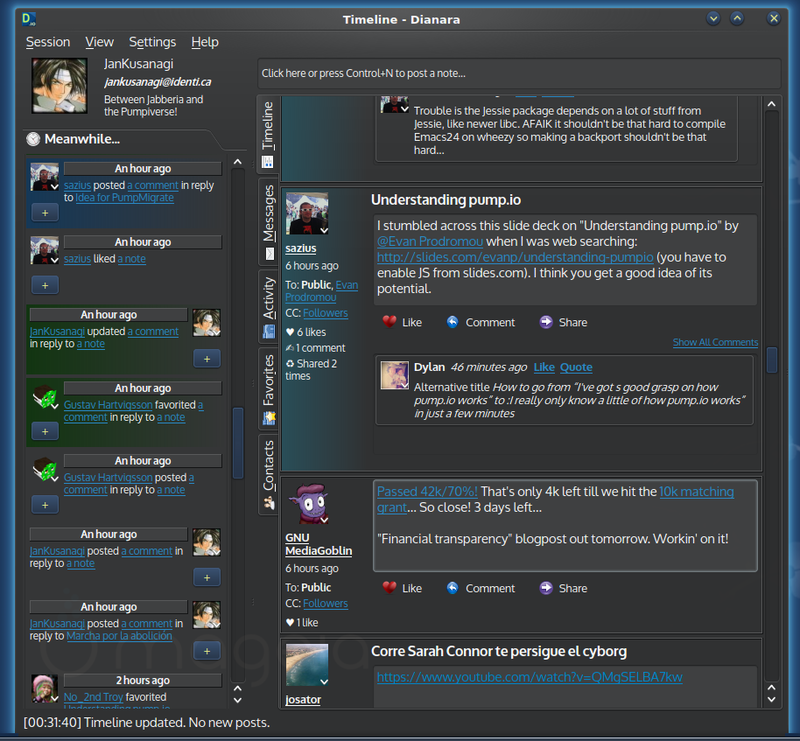 That is what I basically do at the Kubuntu forums, such as with Calligra apps etc. which I use exclusively, and that in a MS centric world, I’m a college teacher. So, anyway, the above question, and if I can be of help I would be glad to help as I can. Identi.ca is not deprecated. It used to be a StatusNet server, and now is a pump.io server. If you register an account at a server like pumpity.net, you’re registering a Pump.io account, not an “identi.ca account”. Care to explain that again? The screenshots in this blog show the real program, as it was at the time of said screenshots. “Since I am running Trusty, I did the ppa for i386 for the 1.1 and still, I don’t see the side tabs, etc. What I see is the “gray version” but again, but there are no side tabs, etc. and no way to enable side tabs etc.Since I am running Trusty, I did the ppa for i386 for the 1.1 and still, I don’t see the side tabs, etc. What I see is the “gray version” but again, but there are no side tabs, etc. and no way to enable side tabs etc. The side tabs are an option available under the “Settings > Configure Dianara” menu. I don’t know what the “gray version” is. So, again, maybe you can explain what you installed, how you set it up, and what the problems are in a different way. However, bet that as it may, I tried anyway and actually made an identity. The discussion of Dianara indicated that it would work with identica and so I then installed the KDE/Kubuntu 9.1 version which is in the repos. I was able to “import” the identica/pumpity identity with seemingly little effort. However, the GUI which I see is the second image down, the “gray” one. The colours may be a default of your particular colour scheme, but there is no way to change the colours on the 9.1 version. There is no avatar icon on the top left corner. The tabs are on the top and there is no way to move them to the left in the settings. The left panel has the word: “Meanwhile….” and lists what I have attempted to do. I applied the farm game and it did, indeed, post to me that I was not watering the plants and after four posts the plants died. The only difference between 9.1 and 1.1-1 is that there is an avatar icon at the top left, however, I cannot add an avatar, even though a requestor box appears, and I can navigate to an image, I used a small one that I use at Facebook. However, again, to restate, I cannot move the tabs to the left in settings. I thought that possibly the “import” function was the problem so.. I deleted all dregs of any information in the system about the original identity. That was quite an effort, since, as you know, there is no “remove identity” function, it was a manual culling through all of the files/scripts on the system. Not a biggie hassle I’ve had to do it before with other beta apps, but it is doable. I then made a new identity at identica and imported it into the 1.1-1 version. Still no change in the appearance of the GUI and no way to change the GUI from the top tabs. The left activity panel is still there. I used all of the possibilities presented and also just copied in “raw URL” for my Facebook and Twitter pages, with no results. I can see notification panels below the tabs which report this, but with no “avatar” picture, there should be one, since I have them at Facebook and Twitter. They are not “clickable” or interactive. The word “Hometown:” is there. I get the “notification” popup when something happens. b) if it is such a version, then there might possibly be other libraries which would change the situation, however, there is one, and only one, file of Dianara in the repos. c) I have been involved in the “usability testing/ GUI trying to cause crashes, etc.” of a similar app that was set up at a forum a few years ago. I am not a coder. d) I am interested in getting the app to work, since I teach at a college and advocated the use of Linux in general, Kubuntu in particular and would use it my postings to Facebook and Twitter, although I do not follow many people, per-se. e) I run a dual core AMD 4.2 mhz with an nVidia 6600 card, and have cable internet. f) If I could participate in any way I would be glad to do so and have the time. Again, thanks very much for the timely reply. 1.- Identi.ca is not deprecated, it just has the registration of new accounts closed. No problem, people just have to register their pump.io account somewhere else. Since it’s federated, it doesn’t matter. When you registered an account at pumpity.net, you did not create a “identi.ca identity”, you created a pump.io account. Identi.ca is just one of many pump.io servers, just like microca.st or pumpity.net. 2.- Dianara’s colors depend on the color configuration of your environment. 3.- There is no Dianara 9.1. There was 0.9, then 1.0, then 1.1 (current). 4.- The side panel can be shown of hidden by pressing F9, or using the corresponding option in the View menu. 5.- Again, the setting to put the tabs on top, left, right or bottom, is located under the Settings > Configure Dianara menu. 6.- I don’t know what all that facebook/twitter stuff is about, but Dianara does not work with either of them, nor do I use them. You can follow people on any Pump.io server. You can try following me: jankusanagi@identi.ca. You do not need an identi.ca account to do that, any pump.io account will do. 7.- Dianara does not interact with facebook or twitter. There are, however, ways to make your pump.io account post to twitter and other networks, but that’s a Pump.io thing, not a specific Dianara thing. Apparently the forum software did not allow the link for some reason. Pido una característica, poder buscar entre los mensajes en la linea de tiempo principal, me refiero a buscar una palabra y encontrar las entradas que coincidan enel titulo o en el cuerpo del mensaje. Bueno, no seria demasiado problema, pero solo buscaria entre los 20/30 posts que tengas visibles en el momento. Bueno, el “perfil” como tal, en 1.2-dev ya puedes verlo. alla donde salga un avatar, sea post, comentario, o actividad del meanwhile, tienes el mismo menu en el avatar, y el perfil completo en el tooltip. Ahora, lo de abrir una pestaña con sus posts no es posible de momento. Hasta donde yo se, la API no provee una manera para eso todavia. O por lo menos, no para usuarios que no esten en tu mismo servidor. Dianara 1.2.1 in Debian testing. Yes, that’s a long-standing issue in Dianara (did you check the BUGS file? ); the way the timelines are completely reloaded when updating causes all previous content to go away, and this happens after you post a note/image/etc, so the “unread status” goes away too. Pumpa 0.8.3 just shows a small image and starts a Web browser if I click it. Well, this is actually a feature! The image viewer gives you the option to save the image in either format, whatever format the original was. Cannot like or share an item visible only through the Web UI of a server I am not registered at. I don’t understand the problem. How is this related to Dianara? I am registered at identi.ca. I can follow any user on identi.ca using Dianara or the Web UI. I can “like” old posts of identi.ca users using the Web UI. I can follow that account by pasting that into a field on the Contacts tab. But how do I “like” the old pre-following posts by that account — with the Web UI or with Dianara? To do that you’ll need to use the web interface. If the account is at a server different than yours, you’ll need to use the “Remote login”, using the “Have an account on another server?” link. forced to use https. That’s really bad. Never force is good. be opconal. pumpa lets you choose safe or not safe. You can run Dianara with the ––ignoresslerrors parameter to avoid that. You can also run it with ––nohttps if your server uses the http:// schema (which is not recommended for a server, but your choice either way). Is this related to this other comment https://jancoding.wordpress.com/2017/12/30/release-of-dianara-v1-4-1/#comment-3526 ? Hi, Actually not, however, dianara has been build against the packages, mentioned in the instructions file. See the spec file as well. in the official repo’s of fedora. Please remove the link to my ‘builds’.